A few days ago I posted about something gaining speed in the "do good today" coffee world; suspended coffee. Where you buy yours, and one or two more a hundred extra and ask the coffee shop to give it to whomever might need it - mainly those 'down and out' (see my previous post). This afternoon I'm enjoying an iced coffee, reading the news and come across another feel-good story regarding free coffe - this time from Ellen's Good News on Yahoo (Source). Alyssa Josephine O'Neill was a normal, outgoing teenager, a cheerleader at her Erie, Pennsylvania high school, and was preparing for her freshman year at The Behrend College. She had been diagnosed with epilepsy in January 2012, but didn't let that stop her from enjoying her life. On September 3, Alyssa texted her mom asking if they could go to Starbucks so she could try a Pumpkin Spice Latte for the very first time, but they never got the chance. The next day, the 18-year-old passed away from an epileptic seizure. "We tried to think of something that we could do that would be a little bit positive," her father Jason O'Neill told us in a Skype chat. He and his wife, Alyssa's mother Sarah, went to their local Starbucks and bought Pumpkin Spice Latte for themselves, as well as the next 40 customers. All they asked of the baristas was that they write #AJO on the cups, and explain to the customers why their drink was free. What they weren't expecting was that customers who received their drinks would respond the exact same way, by paying it forward. Soon enough, the O'Neill's #AJO campaign spread throughout their community, the country, and the world. donating $600 at a different location,"
says Sarah. "It just spread like wildfire." The acts of kindness in Alyssa's memory aren't limited to the seasonal beverage. The O'Neills hope that people will be inspired by this movement to do other good deeds to improve the lives of others. "Just take the five minutes out of your day to do something nice," says Sarah. "It doesn't have to cost you a dime." Says her father, "We'd like to pay it forward and try to make everybody a little bit of a better person, because that's what Alyssa did." If you'd like to learn more about Alyssa and the O'Neills' campaign, visit ajoforever.com. What is up with the popularity of horse head masks? Or Unicorns, pig masks or squirrel masks for that matter! Tonight's post isn't about 'coffee' but it's after 8:pm, I'm hanging out until it's time to take my dogs 'out' at 9:pm and yes... I've just finished 2 cups of coffee. So, there is a coffee-tie-in. Kind of. Sort of. Let's talk Halloween masks. And uh... horse head masks? (And unicorn masks, pig masks, squirrel masks and more). Apparently there is something going on with horse head masks and everyone wants one. Why? I have no idea. In my little circle of friends, none of us have one, none of us want one. But apparently it's cool to have one, wear one in the craziest of places (go into the gas station and buy a Slurpee wearing your horse head mask? Ok... I guess.) Although I may think it's bizarre it's a fad... and it's popular. When I looked them up on Amazon I was a little freaked out by it. I'm not sure why. But I was. I can tell you that come this Halloween I'll be more likely to dress as a witch, a hot dog or even a bunch of grapes than I will be to don a horse head mask. So tell me, what in the heck is the deal with the popularity of this mask and wearing it with your hoodie sweatshirt hood up!? Yesterday while running errands, I stopped in the local sporting good store to 'window shop'. One of my favorite areas to browse is the camping supplies aisles. As I wandered through, I noticed something 'new' in the camp-friendly food display. Coffee. Not instant coffee, but real, honest to goodness coffee that you brew in a lightweight pouch. I hate instant coffee. To me it tastes a little bit like burnt beef bouillon. I gladly give up space and weight to bring my aluminum camp coffee pot and ground coffee with after having had to endure a camping trip with instant and later, a second camping trip where I literally left the camp in the early morning, drove to the nearest gas station, bought a large, hot, fresh brewed cuppa and returned back to camp to join the rest of the crew for breakfast. That is how much I hate instant... but love my morning coffee. Always dubious of new things hitting the market, I picked it up and inspected it for myself and read the instructions. It's a heavy duty but thin and very light weight mylar style pouch, like you find Mountain House and other packaged freeze dried foods in, but comes with a capped pouring spout and an opening in the top in which to put your hot water, which flows over the coffee grounds and brews hot coffee. That was a really long sentence. Sorry. It's called "Nature's Coffee Kettle" and comes with 1 ground coffee packet included. Real Coffee for the Real Outdoors. Not instant coffee, brews real coffee in a bag. Simply: POUR, WAIT, and ENJOY. Lightweight: No need for French press or other bulky gear. Weighs just 1.2 ounces. Compact: Everything you need to make four or more cups of real coffee in an ultra-thin pouch. Bold Taste: Made with 100% Arabica coffee beans, the taste will absolutely surprise you. Note: The slower the pour, the stronger the brew. Tip: seal zipper and tilt bag to refilter. Reusable:The sturdy bag is reusable and has many purposes. Use our refill packs to save money and waste. It honestly was very, very light. 1.2 ounces. It brews 4 cups of coffee, and by following directions and pouring the first cup very slowly, I can get a nice, strong brew. Also, while you could reuse the bag for other things or toss it after use, the thing I liked about it was they also sell refill packs. When the coffee is gone, it's back to being a lightweight mylar pouch again (think Capri Sun style) so it can be repacked, taking up little space and the next morning used again with a simple refill pack that is similar to the little packs you see in hotel rooms. I didn't purchase the Nature's Coffee Kettle yesterday as I wasn't purchasing anything that trip, just browsing. However, I honestly do plan to go back and buy it before our next camping trip. I'm trying to downsize our camping gear and weight - without giving up a few important amenities. Everyone is different and have different priorities when camping. 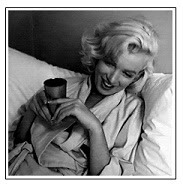 One of my priorities is good, hot, strong coffee. I can put up ground sleeping, smelling like a campfire and not washing my hair for a week. However I'm not willing to give up my morning coffee if I don't have to. And with this light weight pouch, I may not have to. I'll do a follow up review once it's been tried. Regular readers know we have two dogs we rescued as new puppies last Spring. I go 'out' with them every morning and typically try to take a nice, hot cup of coffee out with me to enjoy. Last week I was walking around our back 'yard' which is not really a yard at all as we live on the side of basically, a small mountain and is almost pure rock leading to the woods behind the house. As I stood there watching the dogs I looked down and saw this little tree growing from a small crack in the middle of the rock. I chuckled to myself and thought; "Wow, that is one tenacious little tree" and snapped a picture on my phone. To me, I see it and think; Persistence. Strength. Tenacity. We enter a little coffeehouse with a friend of mine and give our order. I ask my friend: What are those 'suspended' coffees? three for them and four 'suspended'. the square in front of the cafe. Do you have a suspended coffee? someone who cannot afford a warm beverage. It is generally an anonymous act of charity. Officially, that picture has nothing to do with suspended coffee, but it looked good so someone, somewhere used it with the story and well, it's starting to spread like wildfire. Yes. Kind of. Sort of. But not so much in the USA. 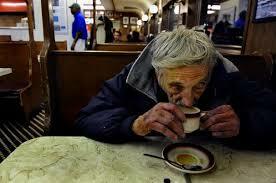 A caffè sospeso (Italian: suspended coffee) is a cup of coffee paid for in advance as an anonymous act of charity. The tradition began in the working-class cafés of Naples, where someone who had experienced good luck would order a sospeso, paying the price of two coffees but receiving and consuming only one. A poor person enquiring later whether there was a sospeso available would then be served a coffee for free. Coffee shops in other countries have adopted the sospeso to increase sales. Although it originated in Europe, a few news articles I researched this morning said that various reporters had visited various coffee houses to see if this was true and many said they hadn't had anyone purchase 'suspended' coffees in 15 years or so. However, with the internet's help I can almost guarantee this is now going to be catching on (again) only possibly, in an even bigger way. People love to help, like to give, want to make a difference but many have no idea how, don't have a lot of money or just aren't sure what or where it's needed. How EASY it is to pre-pay for a drink or a sandwich and allow it to be given to someone later who needs it? Well, it is easy... if the vendor has some way of suspending the sale, keeping track... and is honest enough to give it away again when requested. This act of charity depends not only on the giver, but on the honesty and accommodation of the coffee house. You can find a few websites and blogs helping to spread the word (like this one; SuspendedCoffeess) but right now it's hit or miss whether or not you find one actively participating. Remember... the less fortunate person also has to know it exists in order to enter an establishment to inquire if there are any 'suspended coffee's' available. This easy yet 'doable' idea of free coffee depends solely on word being spread and coffee shops actively participating. But with generous hearts of Americans coupled with social media outlets like Twitter and Facebook, I don't think that will be a problem. And if you don't know of a participating coffee shop, you can always do it the old fashioned way. Simply buy an extra coffee and give it away or purchase a gift card and hand out the gift cards to those less fortunate who could use a hot drink or hot meal. Hot Ginger Ale. So... like Apple Cider with Fizz? Who am I to judge what others want to drink, right? 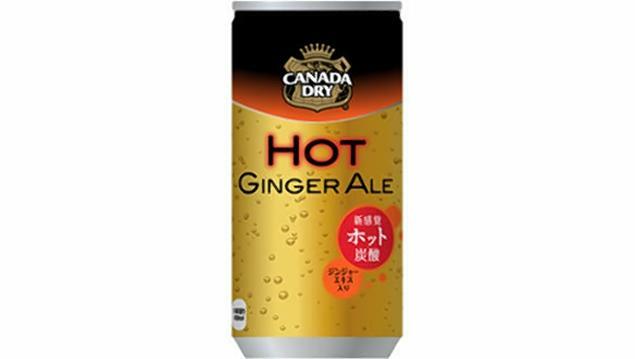 But admittedly, when I saw an article announcing "Coca-Cola Japan introduces hot ginger ale" -I had a gag reflex. Japan likes to launch some uh, interesting items (Pepsi flavored Cheetos anyone?) 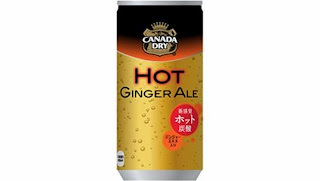 but now, let's heat things up; Coca-Cola Japan will launch first-ever hot can of Canada Dry Ginger Ale in vending machines Oct. 21. While my initial gag reflux was due in part because the only time I really drank Ginger Ale as a child was when I was sick and my parents would offer to it to help quell my upset stomach - after reading more of the details of this drink I'm thinking, "Well, on second thought, maybe it's not so bad." The cinnamon and apple flavors it reportedly use reminds me of nice hot apple cider. But with fizz. Yes, apparently they've been able to maintain the carbonation through the heating process - and that my friend, has my interest piqued. Unfortunately, unless I want to travel to Japan in October or perhaps try to find some on ebay, I'm out of luck. It's not going to be offered the USA. Disclaimer: I was given the product through my participation as a BzzAgent for the purpose of a review. I was not paid to write this review. All opinions are my own and honest. Although I don't care for chocolate, I don't really like sweets and I pass up candy for broccoli in a heart beat, I'm a sucker for chips. Even more if it's a sea salt crisp. 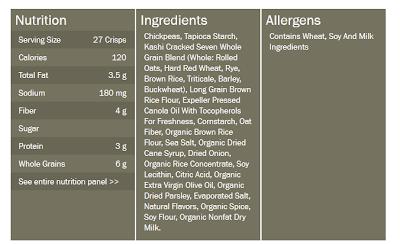 So when I had a chance to try Kashi's Hummus Crisps through my participation as a BzzAgent, I was pretty anxious. My review started with the bag in hand and opening it up, I took a deep breath. My initial thought when smelling the product for the first time was; "Mmmm. It smells like a restaurant." This was a good sign. The crisps on the package look very much like the real product as you can see from my photo. The bag is also very good at keeping the product intact as there were very few broken chips and most were whole. 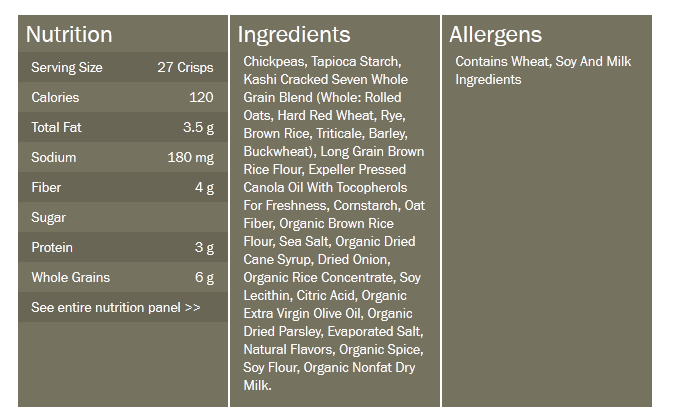 Nutrition is important when deciding on a chip to serve your family but Kashi cares about health so I wasn't surprised to see this crisp offers 4 grams fiber, no sugar and 3 grams protein as well as whole grains. But, how did it taste? I tried to keep in mind this was a hummus crisp (chickpeas) not a potato chip, so I didn't have any preconceived ideas of taste. I found the flavor to be a bit bland at first bite, but keeping in mind regular hummus is also quite bland until it's spiced up a bit. I continued to try three more chips before judging them. What I found, was by the 3rd crisp, I had a better idea of the true flavor. My first bite didn't have much of the sea salt or olive oil on it and was bland. But later bites were improved flavor. Overall I gave it a 6 out of 10. Grabbing a handful, I got a nice mixture of some crisps with more flavor than others. I like a heavy flavored crisp with lots of salt - and these are a light to medium flavor so it's just a personal preference. Later I served them to my family with a light sandwich meal and everyone taste tested them. We all ended up giving them a thumbs up - although we all agreed more seasoning would be beneficial to the flavor. Kashi has a very informative, fun and easy to read website for more information and be sure to check out their Facebook page for products and information! Since I haven't been shopping for any small appliances recently, I didn't know about the Bella brand anything until I posted about their coffee makers this week (post below). Ironically, right after I posted that, I took a trip to Sam's Club for groceries and there it was; the Bella Coffee Maker I posted about, as well as their toasters and ice cream makers. I was able to see, pick up, and inspect their products and although not top of the line or sturdy like a stainless steel or heavy duty version, they are good for a starter set, college kids, a 2nd home, vacation home, or when you want fun, bright colored appliances. I did buy the ice cream maker... I couldn't resist. I've been wanting one for about 2 months and was going to check Best Buy for them later this week. Instead I found it on clearance at Sam's Club. It's a lighter orange than it shows on the box and the outside of the appliance is a thin plastic, but the inner tub that you freeze and make the ice cream in is very thick and sturdy and serves it's purpose well! I was flipping through my Sam's Club flyer this morning while I sipped my morning coffee and saw a brightly colored coffee maker that was just so..... cute? Cool? Bright? Fun? All of the above. The Bella Dots 12 cup coffee maker. I had to go online to see what I could find out about it. It seems to be generally available in almost any retail store for about $35-$45 and comes in a variety of FUN colors. On almost every site I checked it had high marks, many stars and great reviews as a typical, carafe style coffee brewer. The one surprise low rating on Amazon. I am not sure it was warranted. The man who gave it 1 star and horrible review did so for one reason; his wife took the last of the coffee, left dribble in the carafe and walked away, forgetting to turn it off. He came by later, smelled burnt coffee and turned it off. Then ranted about the machine not turning itself off. The thing is, the specs say it does have a 2 hour automatic turn off. But, obviously if there isn't much liquid to keep hot, it's going to burn. It's a human mistake, not an appliance mistake. I can't hold that 1 bad review against the product. Measures 26.85" x 10.55" x 16.73"